Sunlight Cottage is situated on a beautifully developed site with superbly kept gardens, which enjoys a blissfully peaceful & secluded setting just north of Truro. The grounds are well maintained by the owners providing a relaxing outdoor space including a Zen garden which guests are welcome to use. There is a fragrant garden just beyond the Zen garden and a path network through the woodland and meadow area. There is lots of exercise space and rest benches on which to meditate. There is also a pond which has a fitted safety cover. The location is very central and therefore ideal for those wanting to explore the county widely during their stay. This delightful & extremely well presented development is just less than 10 miles to the spectacular beaches at Perranporth, yet the cathedral city of Truro is less than a 10 minute drive away with its superb selection of shops and restaurants. The cottage itself occupies the entire ground floor of a traditional converted agricultural building. It is appointed to a high standard and offers accommodation for up to 4 people. 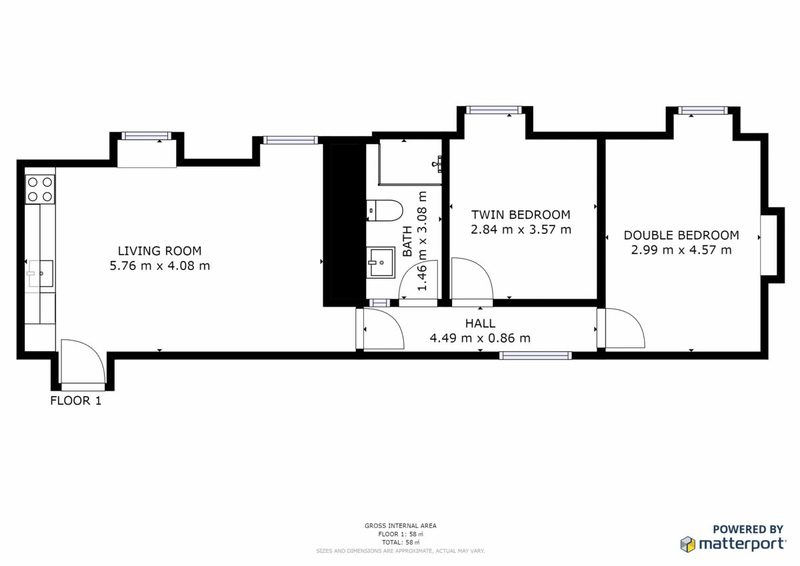 There is an open plan kitchen and living room area. The kitchen is modern and well fitted. The living room looks out to the south west over the rolling countryside. There are 2 good sized bedrooms with a separate shower room. Ground floor only: Entrance through to the kitchen & living room. Corridor through to the main double bedroom, second twin bedroom & newly fitted modern walk in shower (bigger than pictured) with WC. Heating throughout is via electric heaters with an additional electric fireplace in the living room. The living room has comfortable furniture with TV & DVD player. The kitchen has modern fitted units, an electric cooker, fridge with freezer compartment & washing machine. WiFi is available at the property. Bed linen is included, however standard electricity is on a coin meter. Please bring your own towels unless travelling from abroad. There is parking for 2 vehicles. We regret no dogs are allowed and no smoking is permitted within the property. A cot and highchair can be made available on request. There is an iron and ironing board. Nearby The city of Truro is only about a 10 minute drive to the south and has a wide selection of good shopping including a Tescos, Sainsburys, Marks & Spencer and many other high street outlets. There is also a cinema and a great selection of restaurants, pubs & cafes. The resort of Newquay is about 12 miles to the north with its spectacular surf beaches at Fistral & Watergate Bay. Jamie Oliver's "Fifteen" restaurant is located here. Padstow, with its fine selection of restaurants influenced by Rick Stein is just over 20 miles. Harbourside towns & villages such as Fowey, Falmouth & St Mawes are all within easy reach. For those flying to Cornwall, the airport is within easy reach. Truro has a superb range of restaurants from Bustopher Jones & Mannings on Lemon Street to the always popular Pizza Express. There are lively bars and pubs including the superb Old Ale House, a busy Wetherspoons! The Hall for Cornwall hosts everything from Shakespeare to rock concerts and the cinema on Lemon Street has all the latest releases. We had a brilliant week at Sunlight cottage. The hosts were great, Close if you need them but didnt intrude on our week in any way. The cottage itself had everything we needed as a family of four. We all slept really well as its so quiet and no street lights waking us up! Location wise, its was perfect for what we wanted. We visited a different beach every day and were happy to travel around a bit. We will definitely return if we are in the area again. For somewhere that is peaceful, well cared for and in easy reach of north and south coasts this is a very good place to stay. It is equipped to the right level in the kitchen, we like to cook. The dining and living space met our needs. The picnic table was well used being in a sun trap next to the cottage. Also important to us is a comfortable bed and a good shower, the cottage had these. We will be going back. Guest from Torquay stayed for 7 nights. The beds weren't really that comfy and not big enough in master bedroom plus there was a bit of damp too. Other than that we enjoyed our stay and it was value for money we paid. We were saddened to read that you were not entirely happy with the beds. The master bedroom has a standard sized double as listed and all beds have thick, quality mattresses selected for comfort which usually generate positive feedback. Knowing that mattress and pillow hardness is a very personal issue, I keep a selection of mattress toppers to adjust firmness. We always ask our guests to let us know if they are unhappy with anything so that we can do our best to address the matter straightaway. The damp you refer to is due to the unseasonably wet weather and it's effect on Cornish cob. It has been addressed. We were surprised to receive a lower score on customer service as we try to do as much as we can for our guests whilst remaining unobtrusive. Our goal is to give our guests the best holiday possible! :-) We would love to see you again! Guest from Caldicot stayed for 14 nights. We were impressed by the friendliness, care and attention to details of Jill and John and thoroughly enjoyed our stay. Guest from Somersham, Huntingdon stayed for 14 nights. Our stay at the Sunlight Cottage was excellent. It provided an ideal location for exploring Cornwall with easy access to the A30. The owners were very friendly and helpful but at the same time discrete. The cottage was well kept and well provided for and the gardens were lovelly. The bedrooms were spacious and had plenty of storage space for clothing etc. Our only negative comment would be that we felt the kitchen / living room was a little short of work surfaces and storage space for food etc. Not a problem if you eat out a lot or have small kids, but as a family of 4, including 2 teenage kids, we needed to store a larger quantity of food. Guest from Portishead stayed for 6 nights. Fantastic stay, great location to explore Cornwall from, so peaceful. Clean and tidy, welcome pack is a nice touch. We could have done with a bigger bed though, there is certainly the space for it! Great base camp for weekend activities in and around Truro, including Newquay, lands end, port Isaac, Falmouth, Camborne (Chinese) and most importantly Truro football club. A great time we all had coming down from Maidstone. Very good value for money, home from home and everything provided. Guest from Bury stayed for 3 nights. Guest from Ely stayed for 4 nights. We are so happy we have found this getaway. We have family in Cornwall and this cottage is in the perfect place to visit all over this beautiful county. We hope that the cottage will be free next time we come down. As you can see above, cleanliness, comfort, location and value for money, all excellent. We also enjoyed the biscuits and wine that the owners left. We cannot recommend more highly this lovely place. Thank you very much and we hope to see you again soon. Very good value for money,bedding,kitchen area,looked and smelt clean no faults there, parking good,owners very friendly.perhaps a little more attention to detail regarding dust in certain areas,but overall a very enjoyable week, and would like to return one day. John and Jill Tisdale were lovely hosts who could not have done more to make us feel welcome. The cottage is set in the heart of beautiful countryside and, being close to Truro, very centrally positioned enabling us to see as much of Cornwall as possible. It was a pretty little cottage and very comfortable. Perfect base for travelling around the county. The owners are friendly and helpful. This is the 2nd time we have stayed at the cottage and hope to do so again. Lovely location, lovely people, lovely cottage. Lovely, lovely lovely! I can't recommend the Sunlight Cottage enough. John and Jill are lovely hosts and the cottage is very comfortable. The location is close enough to a number of attractions and places worth visiting. Overall an excellent stay. Guest from Lympne stayed for 14 nights. A nice two bedroom cottage central to the Truro area, well appointed and cosy. The owners, Jill and John were very helpfull and welcoming. We took advantage of nearby Newquey airport to visit the Isles of Scilly for a daytrip. We also went to Fowey for lunch on the riverside, the Minac theatre and saw a play and visited many beaches and villages. There is a good pub in the village that does good food, and an exalent village shop/post office/off licence. You are made welcome to explore the five acres of garden that the property sits in. Truro has a farmers market on Wednesday and Saturdays. Guest from Saintfield stayed for 28 nights. We stayed here for 2 months during the coldest winter months, and in spite of the below par temperatures, we had a cosy, comfortable stay in Sunlight. John and Jill are the loveliest hosts - attentive and friendly, whilst also respecting space. The cottage itself is very well equipped - even for our long stay which was not holiday time but a short let whilst settling into a new area. The cottage is finished very thoughtfully too making it feel very homely and welcoming. John and Jill couldn't have been more helpful - from the welcome on arrival, to popping down with post that had arrived for us, and replacing the TV when the other had given up the ghost! Only one tip - a little hand blender in the kitchen would be fantastic for us foodies! All in all, a fantastic stay and we would highly recommend whether for a short or longer-term let. Cornwalls Cottages were very efficient and professional. Guest from Frome stayed for 4 nights. The customer service was above and beyond expectations. We received very welcome recommendations on where to visit, including up-to-date information on events. When we said that we had forgotten towels, they were quickly provided. After being informed of an event that was on that day, we called in to find out more information and were given maps and information to help us on our day out and John went on the internet to provide us with all the details and directions we needed. We were very impressed with the garden and it has inspired us to make changes to our own garden. The location is good for road links to easily reach many areas of interest. Try and avoid travelling through Truro unless you need to, however, as we found it very busy. The cottage was very welcoming and a real home from home in an excellent location for exploring the rest of Cornwall. We really enjoyed our stay and the cottage provided everything we could need. The cottage was a perfect base in a quiet countryside location for a stay in Cornwall. The couple who owned the cottage and lived on the site were very helpful throughout the stay. Everything was perfect with the accommodation and amenities, would book again without hesitation. We are a family of 5 (2 adults, 2 older children and 1 infant) and we had a wonderful week long stay in Sunlight Cottage. We have a lovely warm welcome from the owners and the accommodation had everything we wanted, including a high chair, travel cot and a baby bath and ducks for little one! A really comfortable, well equipped cottage in a great central location to explore Cornwall, we would love to return! Had a fabulous time in sunlight cottage, lovely location, nice and peaceful but also near to the hustle and bussle of Newquay and fistral beach and lovely hosts john and Jill, will definitely visit again. Guest from Crossways stayed for 7 nights. a great base for exploring the Fal Estuary- the city of Truro - Eden Project and too many other attractions to list- the cottage is in a lovely setting- easy to find - friendly hosts - the cottage was well equipped and comfy - really enjoyed our stay ! shame that the Wi-Fi was intermittent- more off than on- that may be a boon for some- but it made it harder to go online for exploring websites for local attractions. Sunlight Cottage proved to be an excellent choice for a 3 day visit to Cornwall. It is set in a quite rural location and has all the facilities and equipment you need. Truro and both the north and south coasts are within easy reach. The owners were very welcoming. Guest from Romford stayed for 5 nights. A lovely holiday in a lovely cottage owned by lovely people!!! My husband, my sister and myself really enjoyed our Cornish holiday and it was so nice, at the end of the day to come home to a nice warm cottage! Guest from Stourport On Severn stayed for 14 nights. Our stay at the cottage was excellent, we had a problem with the steps down to the cottage as my father is quite frail, when I spoke with the owners they arranged for a handrail to be installed, you really don't get such care given to customers very often. I would recommend the cottage unreservedly.